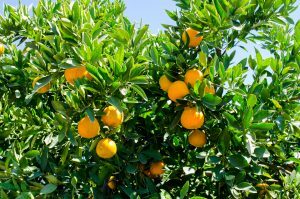 On Jan. 1, 2018, the California Department of Food and Agriculture (CDFA) implemented an emergency regional quarantine to more effectively protect California citrus from huanglongbing (HLB) disease. The quarantine created seven zones: 1) counties where HLB has not been detected and are not next to citrus-producing counties or the Mexican border; 2, 3 and 4) counties widely infested with ACP but not HLB; 5) counties with ACP, where HLB has not been found but is near the Mexican border; 6) counties where HLB has been detected; and 7) counties with partial infestations of ACP, no HLB, and are not next to citrus-producing counties or Mexico. Much of California’s current citrus production is in Zone 2, which includes Tulare, Fresno, Kern, Kings, Madera, Merced, San Joaquin and Stanislaus counties. Under the regional quarantine, the CDFA will be providing new compliance agreements for growers, transporters, grove managers, juice plants, packers and other processors. Shipments of bulk citrus moving between regions will need to be accompanied by a properly completed ACP-free declaration form. Shipments will also need to be in a completely enclosed vehicle or fully covered by a tarp when moving anywhere in California. In addition, CDFA will be contacting production nurseries in order to issue new compliance agreements. Nursery stock tags will be administered on a color-coded, region-specific basis. Initial enforcement will focus on production nurseries, but retail nurseries will have to obtain treated and tagged nursery stock from production nurseries in order to comply with the new regulation.